Why do we shy away from teaching the psycholgy of religion to undergraduates ??? I’ve been thinking this week about why we don’t teach the psychology of religion to undergraduate students. A few things conspired to send me in this direction, a colleague of mine is looking at ‘the teaching of controversial topics’, I’m heading for the end of the academic year and so I’m thinking about new material for next year and finally, I read an excellent article in ‘The New Yorker’ by Gary Marcus on Psychology and Religion. It’s difficult to think of a universal human behavior that we don’t address an undergraduate level, which makes religious belief even more conspicuous by its absence from our curriculum. I’d did think about whether my own institution was odd in some way, but a quick Google search threw up only one undergraduate module at a UK HEI, what sound like a really interesting course at Newcastle. So, if undergraduate psychology courses are avoiding ‘religion’, why might that be the case. Well , I think you can discount the idea that it isn’t very interesting to psychologists, after all it’s difficult to think of a more universal and persistent human behavioural trait. This seems to leave ‘fear of causing offence’ as the most likely explanation for its absence. Given that over the last year I’ve discussed evolution, evil, conspiracy theories and terrorism in lectures without causing obvious offence it makes me wonder why religion should be such a taboo topic. Having given it a lot of thought, in my own case I think the avoidance of teaching ‘the psychology of religion’ is a product of an interesting piece of cognitive dissonance. I spend a lot of time encouraging students to think about everyday issues in a ‘scientific’ manner (i.e. weighing all of the evidence, reading original sources etc etc) and yet some of the very scientists I encourage them to emulate seem to bypass thinking ‘scientifically’ when it comes to religion. The most obvious culprit here is Richard Dawkins. Dawkins’ enormous contribution to science is obvious, and yet when it comes to religion he seems increasingly to exhibit the same ‘fundamentalist’ tendencies that he rails against in others. 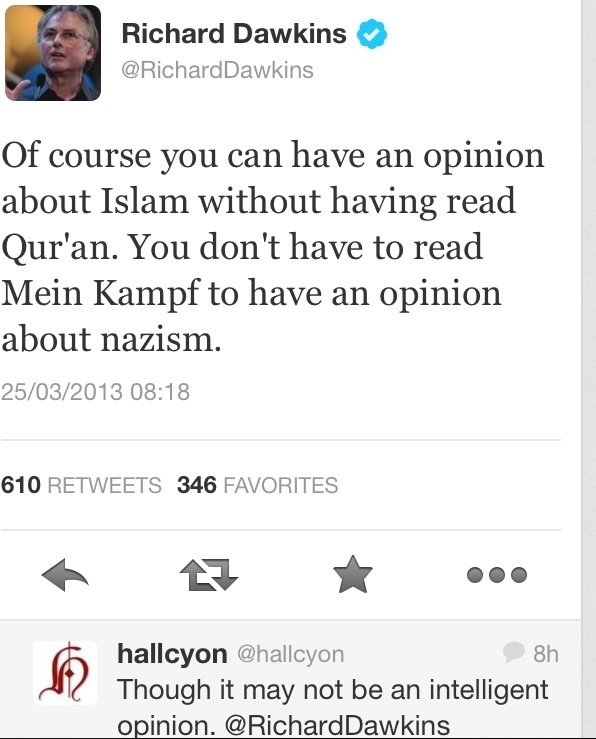 Most recently he has said that he has never read the Quran, but this is OK as he didn’t need to read Mein Kampf to understand that the Nazis were evil. Avoiding for a moment the lovely example of Godwin’s Law, this line of argument might work in a ‘pub’ discussion and indeed might have logical validity, but in a scientific discourse surely ‘I haven’t read the primary source material but I know your wrong anyway’ wouldn’t stand up. Is an avoidance of teaching ‘the psychology of religion’ widespread ? Could you teach ‘the psychology of religion’ without causing offence ? Am I right that it could be Dawkins’ ‘fundamentalism’ that is putting me off ?